Orchids have an undeserved reputation for being difficult to grow and easy to kill, which, unfortunately, causes many people to shy away from growing them in their homes. In reality, you can grow many popular orchid species, such as Cattleya, Phalaenopsis and Dendrobium, at home with simple, common-sense care. Overwatering is a common concern when growing orchids; the ice cube watering method is a simple trick that you can use to avoid over-irrigating your new houseplant. Using ice cubes is a foolproof way to water your orchid. Orchids require just the right amount of sunlight in order to grow successfully. If provided too little sunlight, the plant will fail to blossom; if provided too much sunlight, the blossoms will fade and the foliage will burn. The best way to expose your orchid to the sunlight it needs is to place it within 4 feet of a sunny south-facing window where it can receive filtered light for at least four hours each day. If it's your first time growing an orchid, knowing just how much water to give your new houseplant may seem a bit tricky. Fortunately, using the ice cube watering method takes all the guesswork out of irrigating your orchid. Simply arrange three standard-size ice cubes on the surface of the potting mix around the plant; avoid letting the ice touch the orchid directly. As the ice cubes melt, they will slowly and evenly moisten the potting mix. Water your orchid once a week using this method. When grown in their native climates, orchids use their thick, fleshy roots to draw nutrients from the air around them. When you grow them indoors as houseplants, you must provide nutrients for your orchids by following a regular fertilization schedule. Feed the orchid with weekly applications of a specially formulated orchid fertilizer from early spring through summer. Cease fertilization during the fall and winter months; the plant is not actively growing and doesn't need the steady stream of supplemental nutrients. Occasional re-potting is essential to maintaining the long-term health of your orchid. The University of Tennessee recommends re-potting indoor orchids every one to three years to replace the potting mix and to trim out any problematic roots. 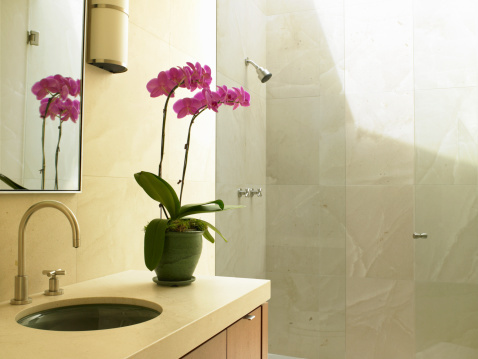 Gently remove the orchid from its planting container and rinse its roots under warm running water. Feel the roots with your fingertips; healthy roots will feel stiff and turgid. 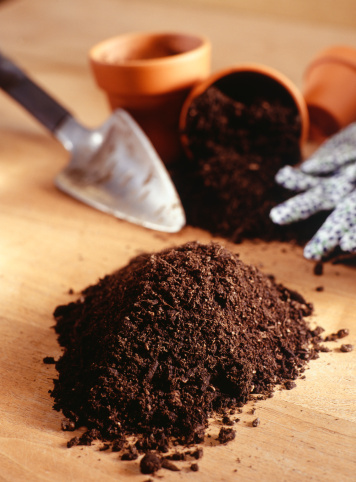 Use a sharpened and sterilized gardening knife to cut out any roots that are brown or mushy. Repot the orchid in a well-draining potting mix composed of equal parts peat moss, redwood bark, charcoal and volcanic rock.